When I got home from work tonight I set the babies up in their walkers in the kitchen. This is a great place for the babies to play while I try to throw together a quick dinner. They especially like getting at the garbage and recycling. The only place they love to get into more is their own diaper bin. 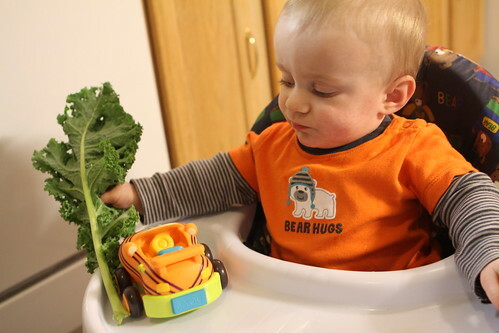 To keep the guys busy I tossed them some kale to play with while I made dinner. Elliott was pretty enthusiastic and managed to rip off a couple of pretty good chunks with nothing but his gums. 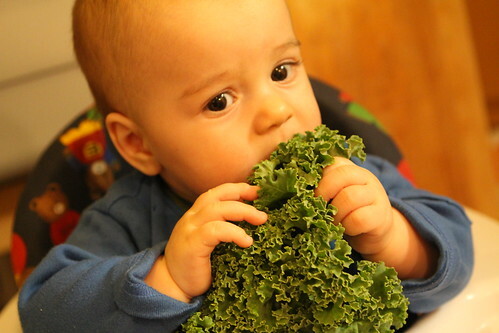 Martin was a little more skeptical and didn't seem interested in using his one tiny tooth to bite into any of the kale. He was, however, quite delighted to toss it around the kitchen and beat things with it. So, basically, he treated it like he treats all the rest of his toys. Before dinner I opened up another beer from Quebec, this I.P.A. 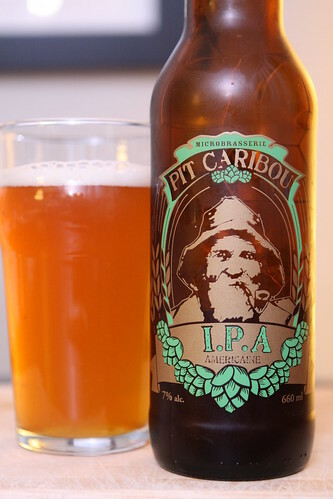 Americaine from Microbrasserie Pit Caribou. It's quite enjoyable drinking Canadian interpretations of American style IPAs, though they generally tend to focus on the west coast styles. There was a lot of yeast sediment in the bottle, something I'm not used to with IPAs, and it had a nice pine and resin flavor to it. The malt was much more chocolatey with a slight coffee taste, something I have never really experienced in an American IPA. I think they could have just owned this as a Canadian style and not had to call it American at all. It was pretty different as far as the malt end of the beer went. 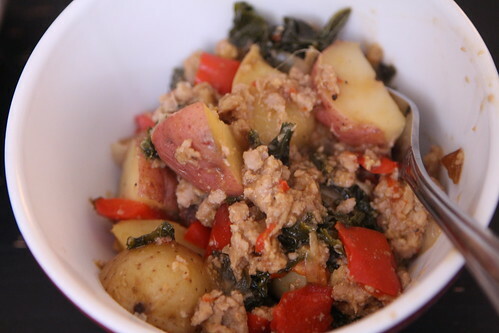 With all the kale that hadn't been tossed on the floor or chewed on I made this stew with onion, potato, red pepers, and some of the remaining pork filling from Chinese New Year. For a last minute, poorly thrown together dinner it wasn't half bad. 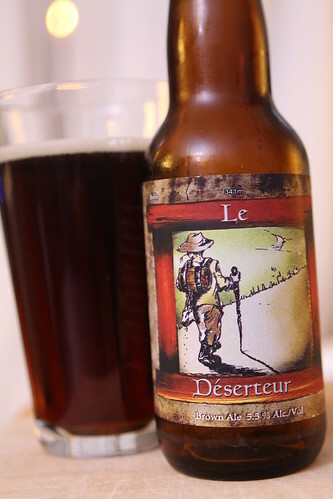 After dinner I had this Le Deserteur, another from Brasseurs Illimités. This was a really nice brown ale but unlike any I've had before. Something about it made it one of the most drinkable beers I've ever had. For some reason I was tempted to drink it like soda. I mostly resisted this temptation and at 5.5% alcohol it wasn't too dangerous to feel that urge. Only 34 more Quebec beers to go before we need to go back up north to stock up! Oh, and visit our family again, of course.